The green flag of the Badr militia can be seen flying on the Abrams tank in the background. 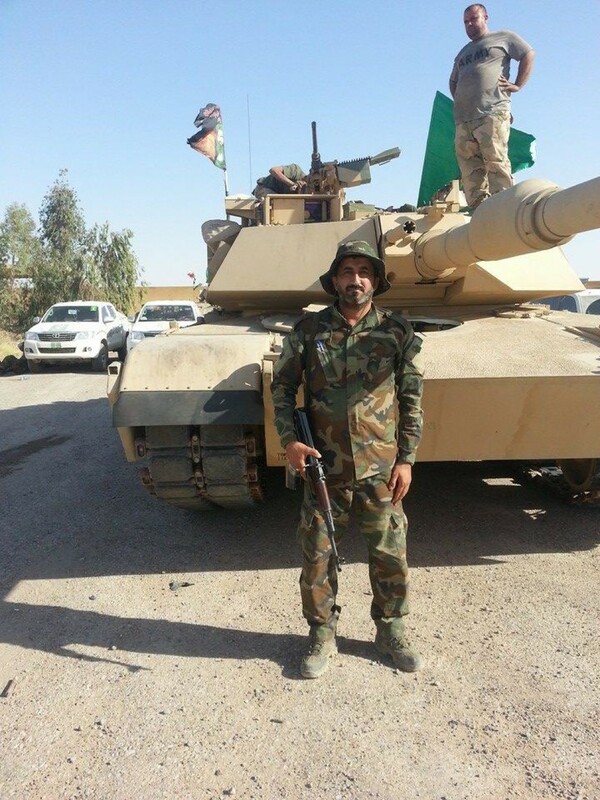 The Badr Organization, an Iranian-backed Shiite militia, has released new photographs showing it to be in possession of at least one US M1 Abrams tank. In both photos, the Badr flag can be seen flying on top of the tank. The photos, which were shared with The Long War Journal by Twitter user @Green_Lemonnn, show at least one Abrams tank being touted reportedly in the Saqlawiyah area of Iraq’s Anbar province. 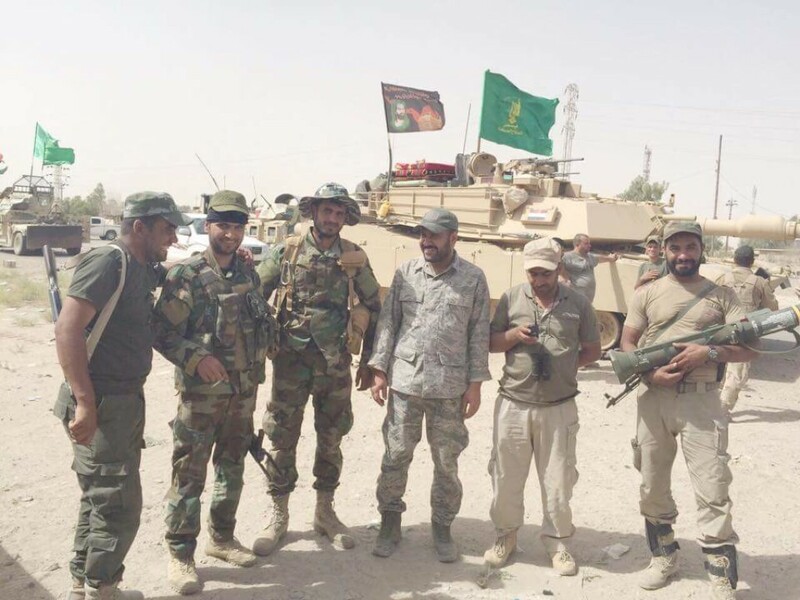 Six Badr fighters and commanders posed with the tank in one photo. One fighter can be seen holding a US-supplied AT4 anti-tank rocket. The US began sending the rockets to Iraq in previous months to help the Iraqi military defeat armored Islamic State suicide assaults. The Badr Organization is part of the Popular Mobilization Committee, which is directed by Abu Mahdi al Muhandis, a US-listed Specially Designated Global Terrorist who is an adviser to Soleimani. Badr is one of several militias engaged in the fighting against the Islamic State. I can see the Duffle Blog article now: Badr Brigade Armor soldiers bitching about how they with they’d gone infantry; all they get to do is use their tank for ECP. Seriously though, let’s see them operate it, maintain it, support it, and fight with it. Preferably against a HBCT. Or a Maverick. We should abandon the concept of a cohesive Iraqi state, there is so much bad blood between the Shia, Sunni, and the Kurds they will never agree to be governed, as a nation, out of Bagdad. A loose confederation is the best we can hope for an is our national security interest.. We need the defeat of Islamic radicals such as IS. Our focus in Iraq should be in two areas, supporting any available Sunni tribes still capable of fighting and support of the Kurds. The Shia, or at least the Shia government in Bagdad has sold their souls to Iran, so screw them. what i see is a typical tanker….out of uniform in the motor pool and on the weight control program! too easy! So much for Foreign Military Assistance to a government whose troops bug out when the shooting starts leaving sophisticated weapons for our real and potential adversaries. Why are we doing this to ourselves? Give these countries defective or dangerous equipment that can be remotely detonated by the U.S. if it falls into the wrong hands! One of the things I have noticed in watching other video’s a lot of surplus equipment US equipment, Humvees, M113 APC’s, MRAPS. Have been given not just to Iraq but to the Baltics. A lot of this stuff just isn’t needed, and is being replaced anyway. The good news these are more then likely M1A1’s. The bad news is Iran will have some insight into the Armor fire control, and the electronics, which is way more advanced then anything they have. As David C has pointed out lets see how many are still running a year from now. This is so infuriating to see our potential rivals getting our tax payer paid for military equipment. We cant trust anyone in that whole theater and should stop funding our enemies on BOTH SIDES. The friend of my friend is my ENEMY! Iran is not and never will be a friend to the US! If Iran is threatened by ISIS then they should fund their own war. This makes no sense! Keep stroking yourselves, folks, about the native tech superiority of Americans. I visited aboard several nuclear subs BITD, American and Iranian, and if anything, the Iranians came up to spec more often than our seagoing cowboys. Replacing engraved control knobs with billiard balls stolen from clubs in Dunoon, for example, was common practice on the US subs. Cool story bro. I love the outlandish claim at the end, it took the story from implausible to satirical.